I’ve been waiting about a week for the major system components, and they finally arrived today. The box was smaller than I expected, but was well very well packed, and I had to spend quite a bit of time getting bubble wrap off of individual parts. Though the box was smaller than I expected, the components themselves are actually a little larger. The photos online don’t really express the size of these components, but luckily they’ll still fit in my storage bay just fine. 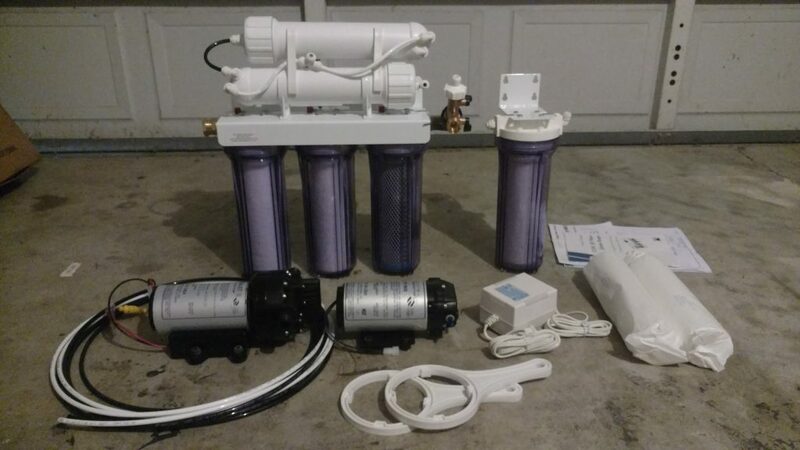 The filters, filter canisters, output wye, standalone filter cap, and standalone filter bracket were the only things needing assembly. The components were all from http://www.rvwaterfilterstore.com – I placed the order over the phone after speaking with Rick Dahl, the owner who was extremely helpful in answering questions about my design. I spent a few days doing online research before deciding to move forward with the RO system, and how in depth I wanted to go with it. I decided to go high end to avoid regrets, and bought the Super Deluxe Package IIB package, with upgrades to dual 100GPD membranes, an additional single canister with a PS-3C cartridge, and an upgrade for the coach pump to the Aquajet ARV model that can output 5.3gpm @ 65PSI. I expected the canisters to be made of flimsy plastic but they’re actually made of extremely sturdy material. The pumps look to be well built and like they’ll last a long time, and the only thing I wasn’t overly impressed with were the brackets that mount the assemblies together and to the wall. Realistically, they’re industry standard and perfectly sufficient for the task, but compared to the rest of the components that seem to be possibly overbuilt, they seem underwhelming. I’ll be gathering the rest of the components for the install and post about the install once some progress is made.